My Most Recent Home Automation: Electronic Blinds. Kind of a random off topic post, but I thought it might be helpful for anybody considering buying electronic blinds out there. For about 15 years my wife and I have been wanting to buy electronic blinds for my west facing windows, and have been stymied by the shortcomings of the different options and the cost. Last month, we finally took the plunge, and made a decision. If you are looking electronic blinds, my shopping experience and decision making process may be of help. We had a few requirements for our installation. We only wanted white solar shades, which simplified things. However, we didn’t easily have access to wired power near our windows. Also, we didn’t want the shades to degrade from the wood trim around our windows. We got quotes from all three providers, and the prices were pretty similar, so cost wasn’t much of a factor (though beware – motorized shades are not cheap!). Somfy: We met with a Hunter Douglas rep who was very helpful in defining the options. Unfortunately, the Sompfy battery operated shade bar looked a little clunky. Each shade required 8 D batteries, so in addition to the motor bar, you had a battery bar right above it. So it doubled the profile of the roller bar, which was the biggest negative. Not to mention I would have to by D batteries in bulk to keep them running (We needed 7 shades @ 8 batteries a piece = 56 D batteries). Lutron: Lutron did have a mini display at the Best Buy in our neighborhood, so I stopped in and checked it out. The shade demo was tucked away in the same room as some speakers and audio equipment, so it wasn’t easy to see. However, the big drawback with Lutron was for battery powered shades you have the same D battery dilemma, but also they have a 4″ tall fascia to hide the batteries and roller bar. So these would be pretty noticable installed on our window trim, adding a dimension we didn’t want. Shade Store: I was leaning against going with upstart Shade store, as they are rapidly expanding (going into a potential economic downturn), so it would be more of a risk for ongoing support if they were to go out of business. The Shade store offers both Somfy and their proprietary motorized shades, and after seeing their proprietary motors, I think they are the best option currently out there. The roller bar is single width, and in the roller bar is a lithium iron battery that you recharge (once a year’ish according to the sales team). This was by far the sleekest profile of them all, and also noticeably quieter than the Somfy’s. However, the home automation app with the shade store motor is pretty limited as compared to the others, and the phone app got terrible reviews. After going around and around on the various options, we finally chose the Shade Store brand. In my opinion, their hardware was the best of the options, so I was willing to risk the company’s upstart nature. The customer service experience I had with everybody in the company was excellent, from the designer to the measurer to the online customer service. The best customer service experience I have had in recent memory. Now that we have had the shades for awhile, I found out a few things. There is a small wifi hub that comes syncs the blinds with the app, and the first thing I did was set my shades to go up and down on a timer. I found that every once in awhile one of my shades would not go up or down on the timer, so I moved the hub closer to the shades (even though my hub was only a room away) and that has solved the problem for now at least. Also, after conversing with customer service, I found out that the Shade Store does support IFTTT, which is a service that allows you to integrate various home automation platforms. So I can set my shades to go down at noon if the solar index is going to above a certain level (i.e. a sunny day), and go up or down at sunrise / sunset each day. I can also program my own rules.. another project on the programming backlog. Regarding the mobile app that got such bad reviews, I have found it just fine. I don’t use it that often, as I just use the remote that came with the blinds instead. If you have a burning need to open or close your shades when you are not home however, the app should suit your needs just fine. If you are in the market for motorized shades, I hope this info helps. This was a surprisingly difficult shopping experience for me based on the options available. Once you get over the sticker shock and select a brand, they are pretty cool. If you stumble across this post during your buying experiece, and have any questions – feel free to drop me a line. 2019 has started out as an interesting year for the stock market. The year was set up with a disastrous December 2018, leading to some gloom and doom over the holidays. I recall telling friends in December (following the 5% Christmas Eve drop) that I thought there was a decent chance January would be positive, and if so, take that as a selling opportunity as the rest of the year will be crap. I was right about January, as the market (as measured by the S&P 500) was up a solid 8%. Time to sell? Now… I am going to answer maybe not. In December the Federal Reserve was signalling 3 rate hikes, and there is an old Wall St saying – ‘don’t fight the Fed’. The saying refers to when the Fed is raising rates, be cautious. Now it turns out, in January the Fed has signaled that it may go more cautiously, presumably because the stock market threw a tantrum. Now there are predictions of a rate cut in 2019, even though the economy is presumably as strong as it has been in recent years. 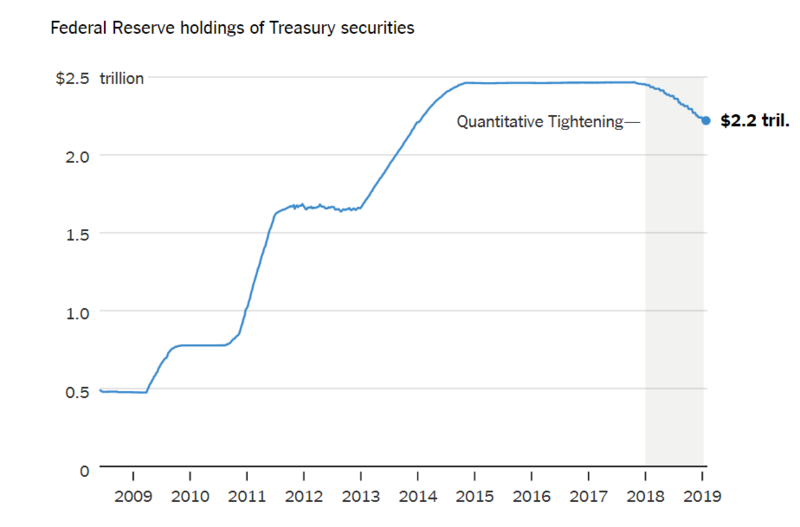 Of course we were told that when good times return, the government would sell off those securities and shrink down the balance sheet. And maybe it’s no coincidence that the stock market had a down year in the first year of quantitative tightening. But now there is talk of stopping this drawdown in 2019 or 2020, presumeably over concern that the economy is slowing too fast. The Federal Reserve now appears to be overly sensitive to the movements in the stock market, which for stock investors I guess is a good thing. This removes one big negative factor for the market I had going into 2019. If the Fed has our back and is working to protect shareholders, I guess I am less negative than I was over the holidays. Other negative factors still exist, such as slowing growth in Europe, continued governmental dysfunction (i.e. the past and potential future shutdown), and Brexit. So I am still not calling for a great year, maybe just not as bad as I thought. I still think we have some major economic reckonings in the future, it’s just that the Fed is now willing to ‘run up the credit card’ to delay the economic downturn.